I still need to get to grips with the technical aspects of the new camera (Louis), but the focus is much better. Lighting remains an issue. 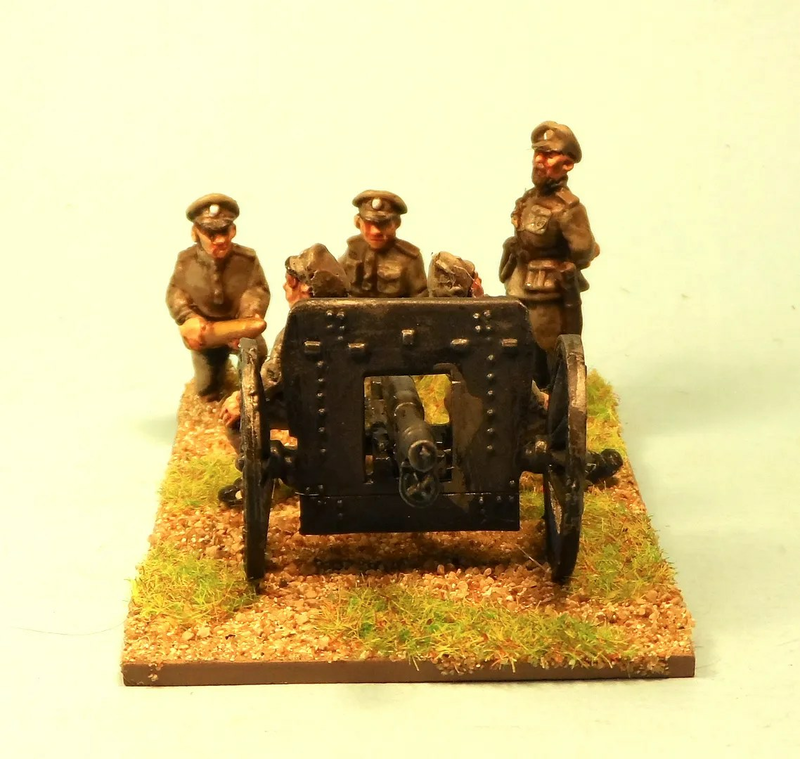 As you can see I replaced the officer for this second artillery piece, with a different one from the Copplestone White Officers pack (BC25). 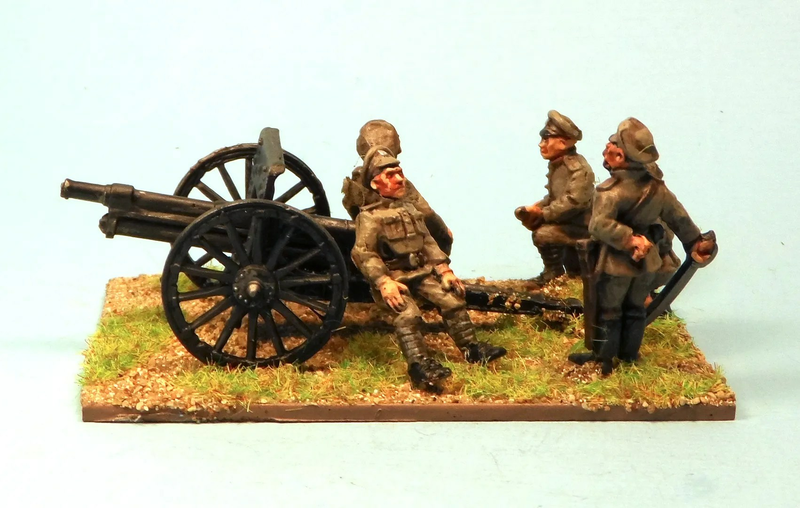 I have a third artillery piece to build which will make a full battery, asnd which will probably be actually deployed only once or twice in my life ! 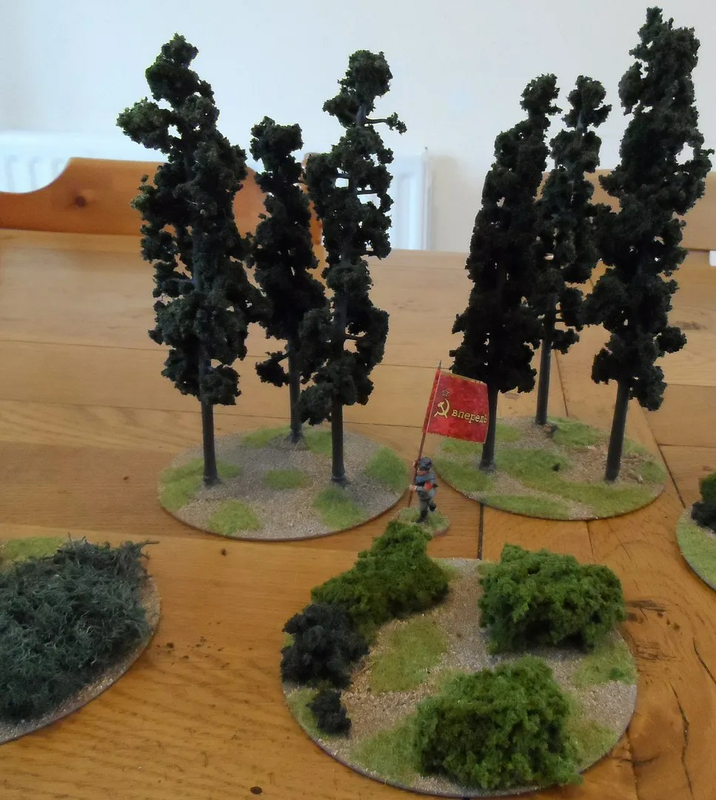 Again I went for Woodland Scenics trees from Antics, and the scale chart indicates they are 24-32′ high on an O/S scale which is roughly 28mm. Which looks more realistic for the figures. The trees will be situated around the buildings on the battlefield, as open steppe of the Don, Kuban and Kalmyk regions is obviously grassland and any trees would be planted around settlements. Album Tracklist goes up. Literally. OK, have finally finalised the running order for the Album. Finally. We wanted to have a definitive list that we wouldn’t have to change for vinyl. I’m a bit old school about Albums, I like it to play as the artist intended and don’t want to jump about or listen to ‘bonus tracks’ stuck on the end of a classic Album. Luckily modern playlisting allows those of you who like to pick and mix to listen how you like. Win Win. It gets better… as this Album has gradually mutated into what will have to be a double LP if it gets on to vinyl, I have added another track to make sense of the timing per side. We are now up to 16, Hurrah! For those of you who asked, here is the tracklist. So no, the previous two EPs only contribute a few tracks to the new album each so you still need to go out and acquire them, YAY, good job I was someone who pledged some money to this project and got the LE Trinity EP signed by the band (he said preening his ego). Now get off your arses and buy the album when it comes out. I am reliably informed by the band, that there will be live gigs later in the year as well. No new eye candy today. 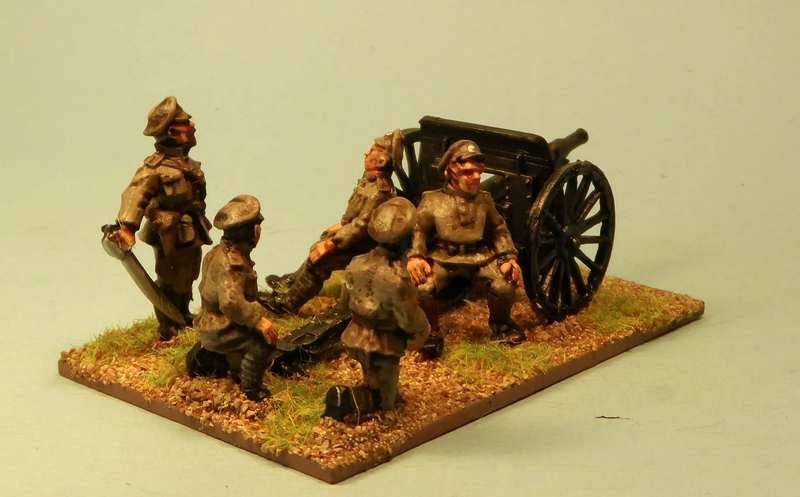 Warlord/Bolt Action plastic late war Germans are superbly detailed, but I’d hate to try and build them all ! I stole some components for my BoB/RCW Shock Troopers, the second unit of which are being painted and will have the excellent new Brigade Games transfers added to them. 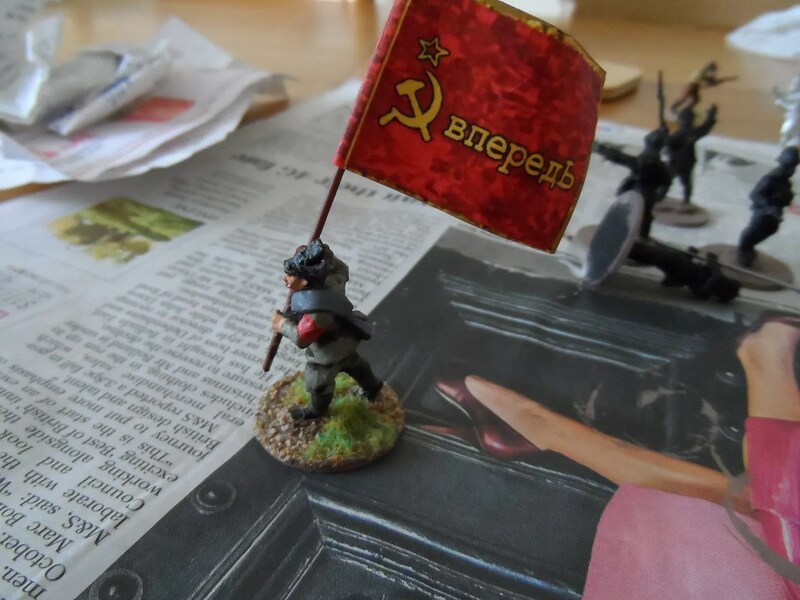 Don Cossacks are being painted. 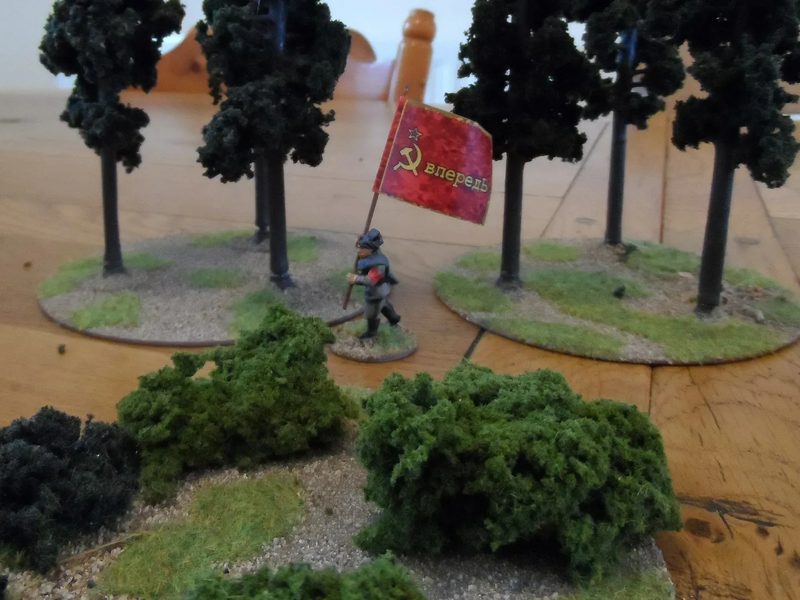 I’ve decided to write some rules for the BoB game in June, hopefully in collaboration with the Byakhees and have been researching some ideas and concepts for designing wargames. Buzzard, taken at a range of 100 feet or more, through my kitchen window. I was particularly impressed with the zoom facility so I could even get details of his lower legs and claws. Neither photo had to be altered, which is also an improvement on my old camera. Light levels were not good but both seem ok. 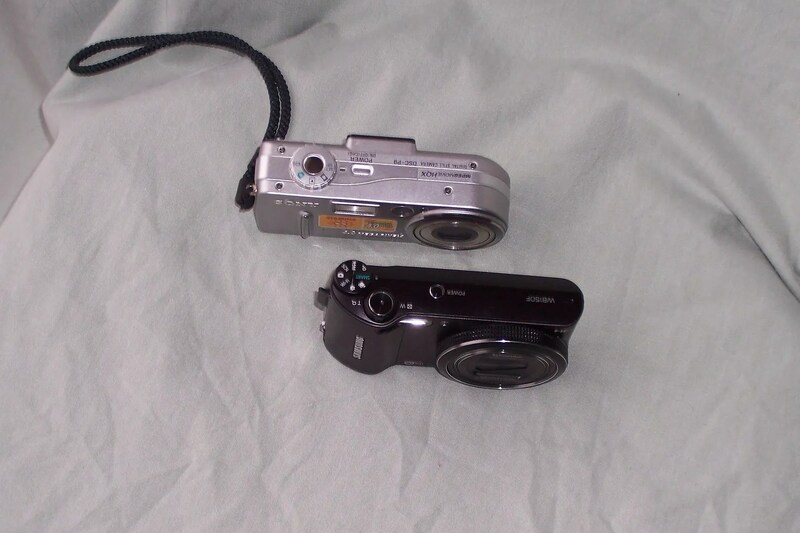 Here they are, the old one is top, in silver, new below it in black. Best of all I got a 8Gb memory card which should hold 2000+ photos instead of the poxy 50Mb card in the old camera which held about 35 photos…which annoyingly meant I’d shoot off to download photos mid game as the memory card was full. Interestingly the shop assistant did almost start swearing when he was trying to take a photo of the figure I took in as the test sample ! 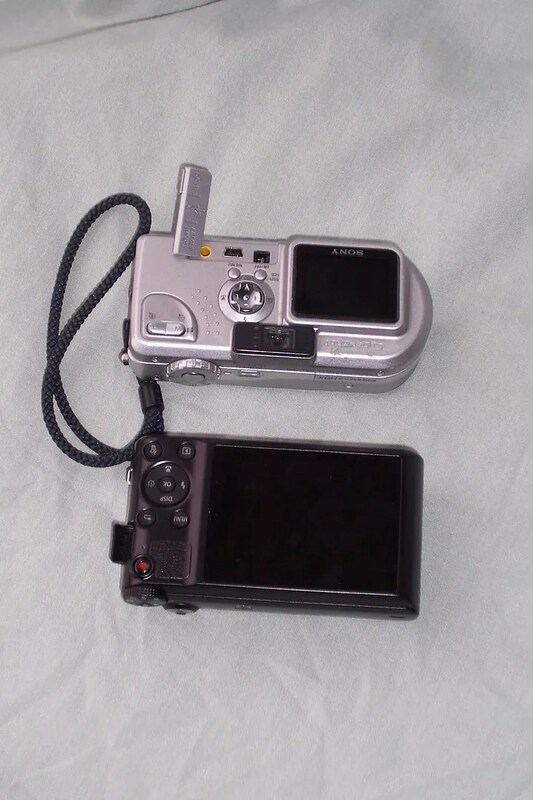 As you can see from the photos (taken by my parents’ digital camera), the new camera features both a thinner profile, and a larger LCD on the back. So from now on, Louis the camera and I, are going to have a beautiful relationship. Did Rick/Han or Strasser/Greedo fire first ? 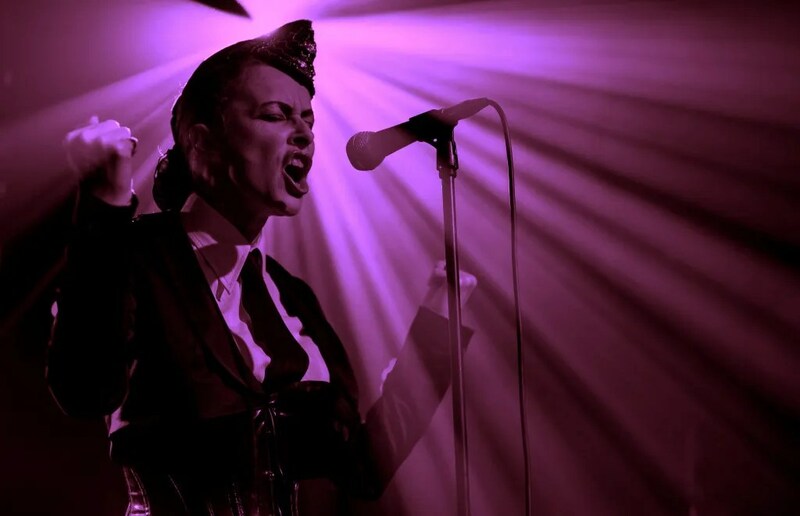 For the total heathens out there, the first film clip is from Casablanca. 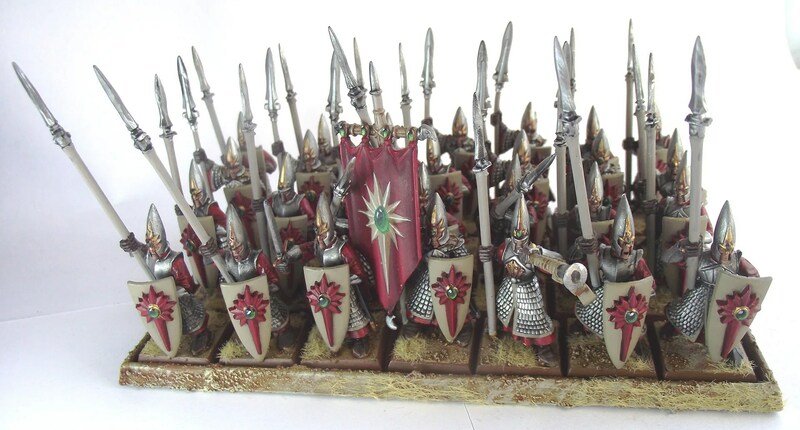 So whilst waiting for the new camera to take some pictures, here’s some WHFB High Elves. Byakhee Stuart painted up a bunch of High Elves in red for a change, a few photos of which have appeared before, but he finished off the entire army…and then sold it so some lucky guy in France. 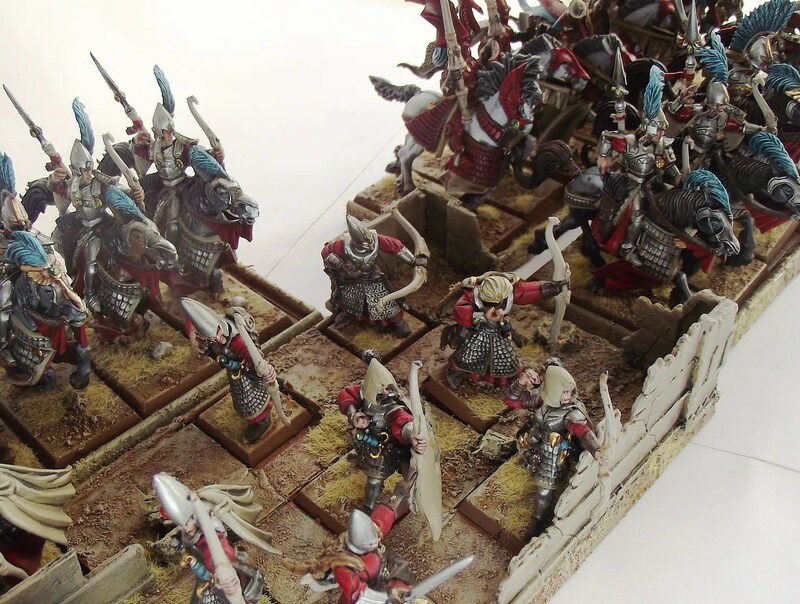 The shots show the completed items with their custom built movement trays – I used some old LOTR ruined wall sections and stuck some corner sections on the trays so it looks like the infantry are holding part of a ruined village or something. 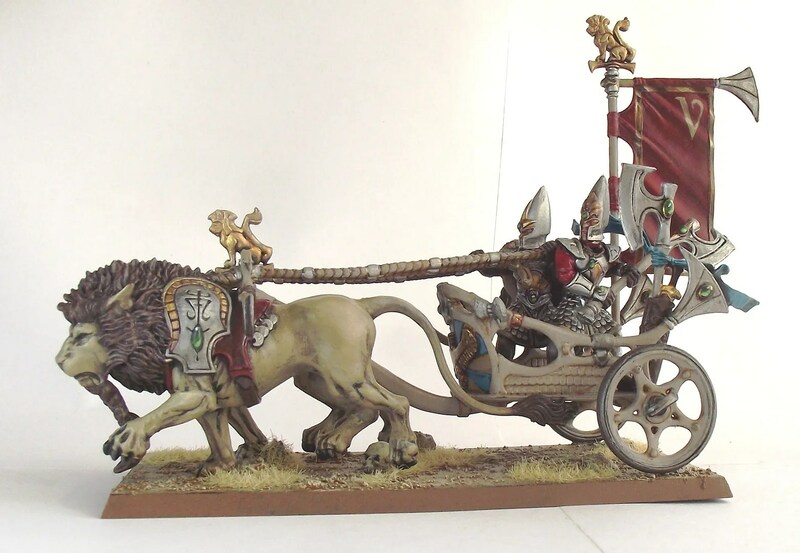 The cavalry, who like wide open spaces, just have plain ones – I’ve seen cavalry trays done with bits of ruins on and I think it looks wrong. Stuart also commented that the bases were done to match in with his Tomb Kings army (more of which to come later). Full set of pictures are here. 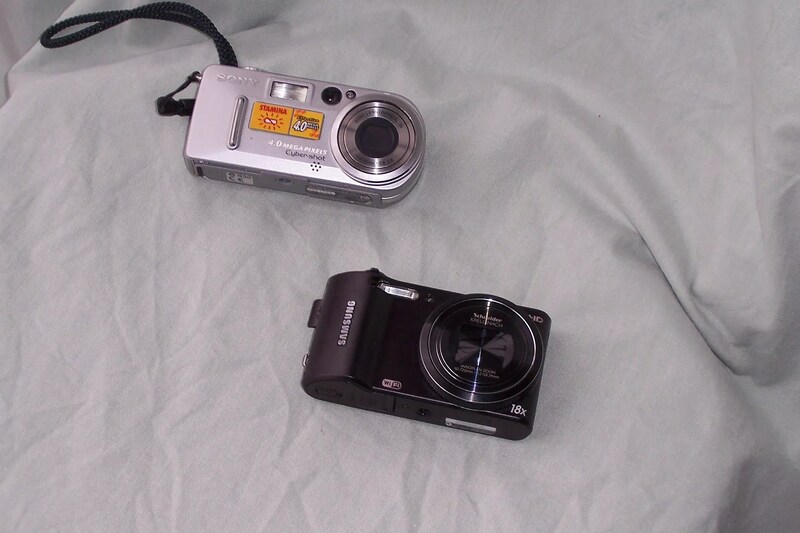 There will be a short pause, as my digital camera has died and gone to silicon heaven. 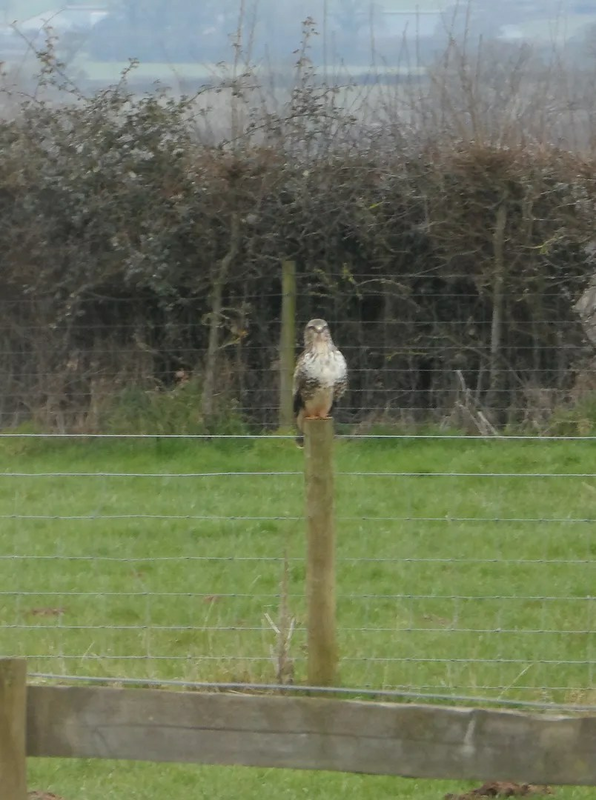 Tried turning it on today to photograph the buzzard sitting on my garden fence, it feebly whirred and tried to bring the lense out but no…it has gone on to a far better place. After a minutes quiet reflection I hopped into the car and headed off to get its replacement. and all mental and physical operations will cease. KRYTEN: I don’t know… maybe I’ll get a job as a disc jockey! LISTER: (Stunned pause.) Silicon what ? Nielson in a packed lift? hairdryers — it’s our final resting place. LISTER: They don’t go anywhere! They just die. tiny little wings, sitting on clouds and playing harps! Earth would machines spend the whole of their lifes serving mankind? Now that would be really dumb! LISTER: (Quietly) That makes sense. Yeah. Silicon heaven. KRYTEN: Don’t be sad, Mr David. I am going to a far, far better place. someone made that up to prevent you all from going nuts! The new one is being charged up and I’ll be getting to grips with it later today. Hopefully my photos will get better now I have a camera that isn’t 10 years old. HUDZEN: See you in silicon heaven! KRYTEN: Silicon heaven! There’s no such place! HUDZEN: No such place as silicon heaven? HOLLY: That’s right! The whole place is a big con. HUDZEN: Then where do all the calculators go? With a spasm of shock, HUDZEN let’s go of KRYTEN. LISTER: So how come yours can? KRYTEN: Well, I knew something he didn’t. would all the calculators go? Phew ! JP and I did a lot of organising over several months to pull this event off. We got more of it right than we did for the first game in February 2012 (sadly not very well documented)…not least because JP’s wife and daughter had the temerity to be ill with chicken pox and he claimed he couldn’t make it – a feeble excuse methinks ! Before anything else I’d like to say thanks to all the players: Jim; Jon (JP); Mort; Rich; Rob; Roo; Tom and Tym. I often lay awake at night and wonder how many fascists I know. Then we had to think up some good “local” scenario based stuff, like the lions, the scarecrow, and most importantly the errant Bishop. Hmm, we should have had a tin-man ! Learning from the battle of Little Hereford, JP and I decided that the attackers of Ledbury (Royalist & BUF) should have more forces to offset the trenches and other defences the Anglicans and Socialists had. Finally, we wanted a bit of drive or discipline, and so opted to force my own group’s house rules on the event. This went very well, and thanks Tom – you got it right you were following the house rules, no cr@p on the table, so thanks to all the gents as it was a nice clean table(s). What didn’t work was our naive attempt to keep the two table in synchronisation. Mort warned us it wouldn’t work, and it didn’t. Having Table 2 with experienced players motoring on ahead, whilst Table 1 with several new players was left floundering in its wake. They soon speeded up though. Mort mentioned putting together a checklist for doing these events and I think that is a good idea so we can share our experience of running large multi player games. This should cover both the logistics and the house rules of playing these Big Games. 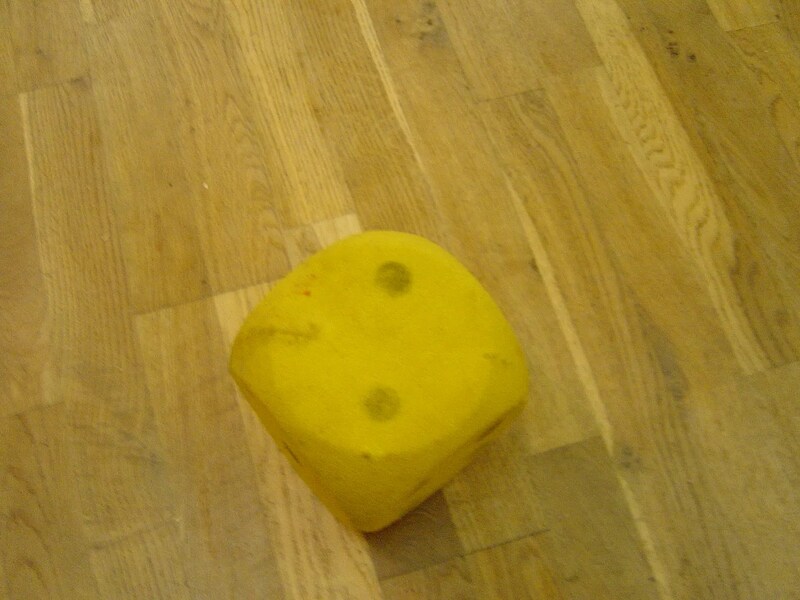 This was the sponge dice Rich found when we were packing the tables and chairs away. It’s about 12″ diameter, and we wish we had found it earlier ! JP, my co-conspirator Lots of material and photos of Table 2. And finally, the full collection of my photos.